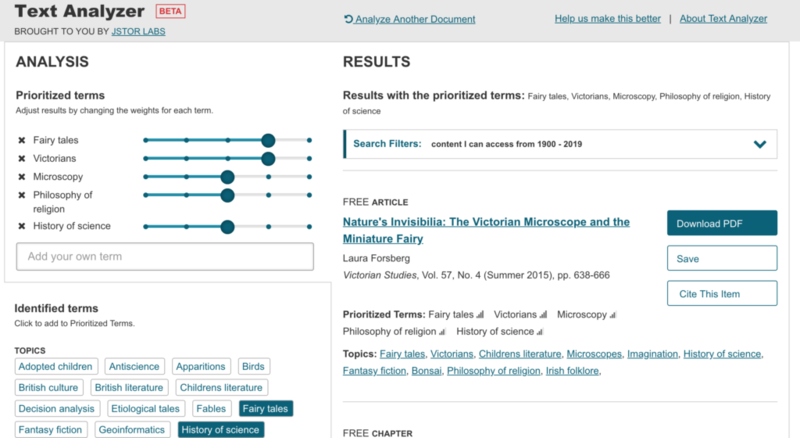 JSTOR, and some other publishers of electronic research, have started building text analysis tools into their publishing tools. 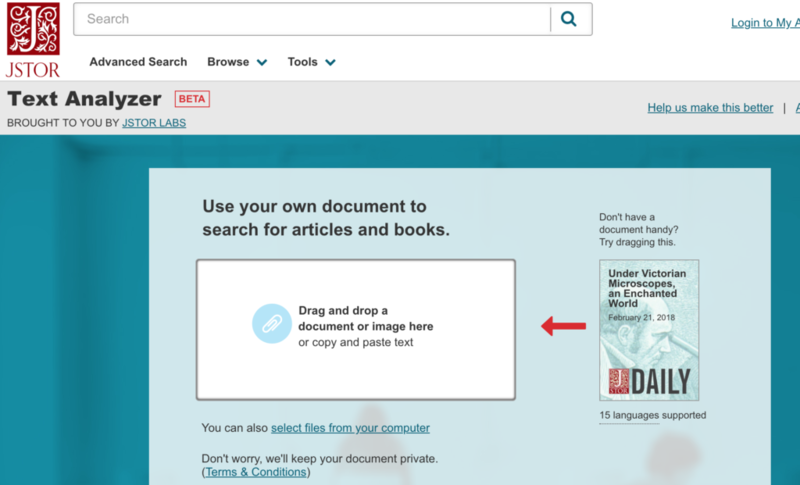 I came across this at the end of a JSTOR article where there was a link to “Get more results on Text Analyzer” which leads to a beta of the JSTOR labs Text Analyzer environment. This analyzer environment provides simple an analytical tools for surveying an issue of a journal or article. The emphasis is on extracting keywords and entities so that one can figure out if an article or journal is useful. One can use this to find other similar things. What intrigues me is this embedding of tools into reading environments which is different from the standard separate data and tools model. I wonder how we could instrument Voyant so that it could be more easily embedded in other environments. These data show that the real problem is not that English is the dominant language of academic publications (and of DH), but that both Anglophone and a high percentage of non-Anglophone colleagues barely use/quote non-Anglophone sources in their research. I can’t help thinking that the internet has allowed the big to get even bigger. The dominance of English in academic circles is exacerbated by the instant availability of English research. National languages don’t even have location as an advantage on the internet. What can we do about it? Miran had a nice reply on Humanist (to the original posting by Greg Crane that was also on Humanist.) Domenico suggests that we all have to take some responsibility, especially those of us who have the “free ride” of being native English writers. It is the responsibility of dominant languages and cultures to translate from marginal or less influential languages. A World Digital Library Is Coming True! Robert Darnton has a great essay in The New York Review of Books titled, A World Digital Library Is Coming True! This essay asks about publication and the public interest. He mentions how expensive some journals are getting and how that means that knowledge paid for by the public (through support for research) becomes inaccessible to the very same public which might benefit from the research. In the US this trend has been counteracted by initiatives to legislate that publicly funded research be made available through some open access venue like PubMed Central. Needless to say lobbyists are fighting such mandates like the Fair Access to Science and Technology Research Act (FASTR). Darnton concludes that “In the long run, journals can be sustained only through a transformation of the economic basis of academic publishing.” He argues for “flipping” the costs and charging processing fees to those who want to publish. By creating open-access journals, a flipped system directly benefits the public. Anyone can consult the research free of charge online, and libraries are liberated from the spiraling costs of subscriptions. Of course, the publication expenses do not evaporate miraculously, but they are greatly reduced, especially for nonprofit journals, which do not need to satisfy shareholders. The processing fees, which can run to a thousand dollars or more, depending on the complexities of the text and the process of peer review, can be covered in various ways. They are often included in research grants to scientists, and they are increasingly financed by the author’s university or a group of universities. While I agree on the need to focus on the public good, I worry that “flipping” will limit who gets published. In STEM fields where most research is funded one can build the cost of processing fees into the funding, but in the humanities where much research is not funded, many colleagues will have to pay out of pocket to get published. Darnton mentions how at Harvard (his institution) they have a program that subsidizes processing fees … they would, and therein lies the problem. Those at wealthy institutions will now have an advantage in that they can afford to publish in an environment where publishers need processing fees while those not subsidized (whether private scholars, alternative academics, or instructors) will have to decide if they really can afford to. Creating an economy where it is not the best ideas that get published but those of an elite caste is not a recipe for the public good. I imagine Darnton recognizes the need for solutions other than processing fees and, in fact, he goes on to talk about the Digital Public Library of America and OpenEdition Books as initiatives that are making monographs available online for free. I suspect that what will work in the humanities is finding funding for the editorial and publishing functions of journals as a whole rather than individual articles. We have a number of journals in the digital humanities like Digital Humanities Quarterly where the costs of editing and publishing are borne by individuals like Julian Flanders who have made it a labor of love, their universities that support them, and our scholarly association that provides technical support and some funding. DHQ doesn’t charge processing fees which means that all sorts of people who don’t have access to subsidies can be heard. It would be interesting to poll the authors published and see how many have access to processing fee subsidies. It is bad enough that our conferences are expensive to attend, lets not skew the published record. Which brings me back to the public good. Darnton ends his essay writing about how the DPLA is networking all sorts of collections together. It is not just providing information as a good, but bringing together smaller collections from public libraries and universities. This is one of the possibilities of the internet – that distributed resources can be networked into greater goods rather than having to be centralized. The DPLA doesn’t need to be THE PUBLIC LIBRARY that replaces all libraries the way Amazon is pushing out book stores. The OpenEdition project goes further and offers infrastructure for publishing knowledge to keep costs down for everyone. A combination of centrally supported infrastructure that is used by editors that get local support (and credit) will make more of a difference than processing fees, be more equitable, and do more for public participation, which is a good too. I was inspired by the ways storybooks have been reinvented for digital tablets like the iPad. We used rhymes to zip through history, and animation and interactivity to playfully revisit a stunning photographic collection and reinterpret great feats of engineering. For the NFB this is part of their larger Highrise many-media project. Perma comes from Harvard Law and allows you to create a permanent archive of something you are linking to. You go to the site, enter a URL that you want archived and it gives you a new URL for the Perma version which lets you see what the page looks like now and what it looked like when archived. This allows us to quote web pages that may either disappear or be changed. Here is the link to the archived version of Theoreti.ca: http://perma.law.harvard.edu/0f8ojk5Phmc – this is a version before this blog entry. Figshare is a cloud based archive for academic data. You upload data and then provide metadata for the dataset. People can comment on it, download the data and so on. It seems to do in a fairly clean fashion what university repositories do. I’m not sure of their business model. I uploaded Wendell Piez’s electronic edition of Frankenstein to try it out. I realized the other day that I have been blogging for 10 years, as of June 11th, which seems like an anniversary. You can see my Welcome message here. The WordPress Dashboard tells me I have 1,921 posts which means I have posted approximately once every two or three days. I confess there are times when I think I should just wrap it up and stop the blog as it feels like one more thing I have to do. On the other hand Theoreti.ca has been useful to me as a place where I know I can find my own notes (as long as I can get to the net). I think I’ll keep on going a bit more. Theoreti.ca is not the first blog I started. Back in 2001-2 when blogs were the new thing (for me) I actually tried starting one a couple of times. The problem was that they were aspirational – I started blogs hoping I would live up to the aspirations for witty commentary I set myself. 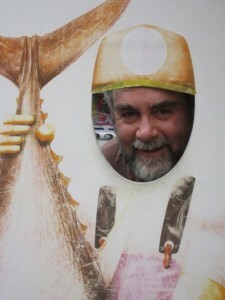 Needless to say, after a few posts I stopped writing and the blogs thankfully disappeared. Theoreti.ca worked because I set out only to keep research notes. I set myself a low bar – write stuff that you might find useful later. The second post is an example of that – a list of possible “intersections of mathematics, computer science, philosophy and multimedia” that could make for a nice lecture series or conference. Not a lot of context, no wit, and not that useful to anyone but me. The question I ask myself now is whether blogging of this sort is out of date. Others tweet such short notes and WordPress is used more for web sites that need a news or essay function. Perhaps I’ll keep going on a bit more, just in case blogs come back like bell-bottom jeans. The Journal of Digital Humanities has republished my Short Guide to Evaluation of Digital Work as part of an issue on Closing the Evaluation Gap (Vol. 1, No. 4). I first wrote the piece for my wiki and you can find the old version here. It is far more useful bundled with the other articles in this issue od JDH. The JDH is a welcome experiment in peer-reviewed republication. One thing they do is to select content that has been published in other forms (blogs, online essays and so on) and then edit it for recombination in a thematic issue. The JDH builds on the neat Digital Humanities Now that showcases neat stuff on the web. Both are projects of the Roy Rosenzweig Center for History and New Media. The CHNM deserved credit for thinking through what we can do with the openness of the web. I now just came across this cautionary story in the Chronicle for Higher Education about Dissertation for Sale: A Cautionary Tale. It seems it is also allowed in the US. From Slashdot a story about how the Faculty Advisory Council to the Library (of Harvard) sent around a Memorandum on Journal Pricing arguing that periodical subscriptions are not sustainable and that faculty should therefore publishing in open-access journals. The Faculty Advisory Council to the Library, representing university faculty in all schools and in consultation with the Harvard Library leadership, reached this conclusion: major periodical subscriptions, especially to electronic journals published by historically key providers, cannot be sustained: continuing these subscriptions on their current footing is financially untenable. Doing so would seriously erode collection efforts in many other areas, already compromised.